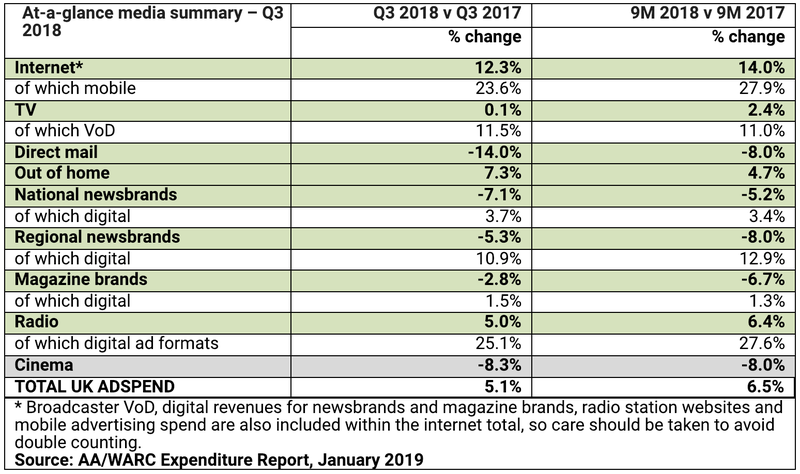 UK Advertising Delivers 21st Consecutive Quarter of Growth in Strongest Q3 Since 2015; Facebook Ad Placements Down 15% as Instagram Grows; and Bloomberg Media Launches TRIGR TV. 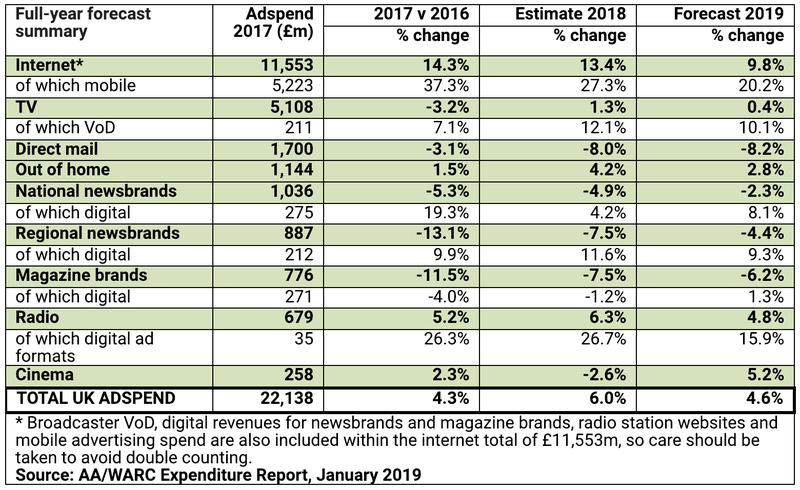 UK ad spend rose 5.1% year-on-year to reach £5.6bn in Q3 2018, marking the 21st consecutive quarter of market growth and the industry’s strongest third quarter of the year since 2015. This record investment highlighted in Monday’s (28 January) Advertising Association/WARC Expenditure Report underpins the preliminary estimate for 2018 ad spend of £23.5bn – meaning the industry will have grown +6.0% year-on-year. The positive figures came ahead of the Advertising Association’s LEAD summit on Wednesday (30 January), which looked at the key themes of Trust, Trade & Transformation in the UK’s advertising industry. 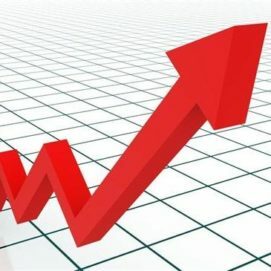 Predictions of 4.6% growth for UK advertising in 2019 come amid calls from the industry for a positive deal for business from Brexit negotiations with minimal disruption. Stephen Woodford, CEO, Advertising Association, comments: “UK advertising continues to perform strongly, now delivering its twenty-first straight quarter of growth and demonstrating the commitment of British advertisers to investing in the growth and success of their businesses. James McDonald, data editor, WARC, adds: “Our projection of 4.6% growth in the UK’s ad market this year is firmly based on a business-favourable outcome from the EU withdrawal agreement, and would mark a decade of continuous expansion since the last advertising recession. Bloomberg Media Group is launching TRIGR TV, an innovative ad solution that brings the flexibility and real-time adaptation of digital advertising to linear broadcast television. Powering TRIGR TV is a new patent-pending technology called ‘Bloomberg Interlink’, an overdue breakthrough in television advertising. Bloomberg Interlink serves as a bridge that connects a traditional broadcast television system to a digital ad server, enabling Bloomberg to place ads in real time and manage advertising inventory dynamically in a similar fashion to web, mobile, and OTT. Bloomberg Interlink leverages the existing TRIGR product technology, which turns market movements into instant opportunity for brands by serving contextually relevant ads driven by market ‘triggers’ seamlessly across the web and social. Now, by marrying Bloomberg Interlink with the TRIGR platform, Bloomberg Media can activate this same capability across Bloomberg TV for the first time. The current state of ad trafficking on television has not changed for decades; and the process is linear and restricted in scope with significant limitations on reaction time once advertising has been scheduled and booked. A key differentiator for digital advertising is the ability to analyse advertisements at the point of delivery and serve dynamic ads based on available inventory. Bloomberg Media’s ad innovation team sought to find a more efficient workflow to serve relevant brand messaging and advertising on Bloomberg TV as they do across digital, and developed a solution to eliminate the manual scheduling for individual broadcast ads. With Bloomberg Interlink, there is now a mechanism for broadcast systems to talk to a digital ad server, allowing for a means of translation between the two disparate systems. The unique system also translates creative asset requirements for broadcast TV factoring in differences of creative attributes between digital and TV. By combining TRIGR TV and Interlink, Bloomberg Media is able to serve dynamic advertising on Bloomberg TV based on market movements in the same way it does across its digital platforms. TD Ameritrade is the launch partner of TRIGR TV, with more advertisers to come in 2019. This new breakthrough in broadcast advertising creates an opportunity for brands to serve relevant brand messages to an engaged audience on Bloomberg TV, delivering instant opportunity based on real-time variables. 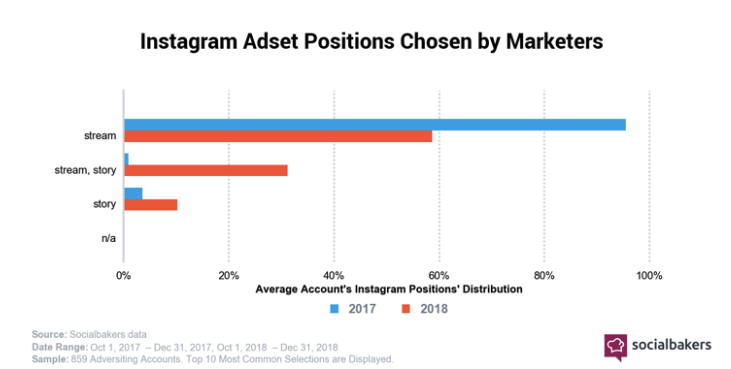 TRIGR originally launched in mid-2017 for digital, and has expanded on to social platforms in 2018. Since launch, Bloomberg Media has seen a consistent lift in user engagement (8-22%) when TRIGR data is used to target an advertiser’s message, leading to strong advertiser adoption. TRIGR TV joins Bloomberg Media Group’s ad product portfolio, which has nearly tripled from eight products in 2015 to 22 in 2019. The company continues to see strong engagement with ad experiences that create native utility to the Bloomberg user. In 2018, revenue from innovative advertising products grew by 44% and accounted for 27% of Bloomberg Media’s total digital advertising revenue. An example of a highly successful innovative ad unit is ad.apt, which enables Bloomberg to convert a simple set of brand elements into a multitude of natively designed formats for display advertising. Other high-performing ad products include Canopy, which harnesses the same proprietary tech that powers Bloomberg’s digital platforms with full interactive functionality, and ScrollView, a mobile experience that reveals a brand’s message as part of readers’ scrolling motion.